Enoch Adeboye rose to national and eventually international prominence upon being appointed as the General Overseer of Redeemed Christian Church of God (RCCG). Hitherto unknown to the public at large, he began his journey to fame at RCCG where he initially translated the sermons of its then Pastor and founder, Rev. Josiah Olufemi Akindayomi, from Yoruba into English. With his undying devotion towards the Lord and his commitment towards helping the common man understand the nuances of Christianity, he helped to expand the church which now has branches in over a hundred countries. Prior to his involvement with the church he had been a lecturer in mathematics at the universities of Lagos and Ilorin. Even though he had always known that God existed in heaven, it was not until he was a young man that he actually realized the truth about God. He had a revelation in 1973 and received the Lord Jesus as his personal Lord and Saviour. Since then he has dedicated his life fully to the service of God. As a born-again Christian he realized that the purpose of his life was to spread the teachings of Christianity and thus he eventually gave up his prestigious university position to become a full-time preacher. •He was born on 2 March, 1942 in the village of Ifewara, Osun State, Nigeria. His parents were very poor and he was one of their four children. An illiterate farmer, his father did not believe in educating any of his children. In fact, the family was so poor that they could not afford to pay the school fees. •Enoch was however very particular about receiving a formal education and when his requests to be sent to school were dismissed by his father, he went on a hunger-strike in a bid to persuade him. •His father eventually gave in and sold his goat in order to pay for his son’s school fees. Thus Enoch was enrolled at the only missionary school in their village. •Even though he started school quite late, he soon realized that he loved to read. He was admitted into the Ilesha Grammar School, Ilesha, Osun State, Western Nigeria in 1956. It was here that he discovered his passion for science and mathematics. •He badly wanted to pursue a higher education but the ongoing Nigerian Civil War and his family’s dire financial condition threatened to thwart his ambitions. Yet he chased his dream relentlessly and ultimately obtained not only a Bachelors (BSc.) degree in Mathematics from the University of Nigeria, Nnsukka, Nigeria in 1967, but also a Masters (MSc.) Degree in Hydrodynamics and a Doctorate Degree (PhD) in Applied Mathematics, both from the University of Lagos, in 1969 and 1975 respectively. •As a young man he had one great ambition—to become the youngest Vice Chancellor (University President) of any one of the frontline Universities in Nigeria. Given his brilliant academic records, it seemed like he would achieve this dream soon. •He began his career as a lecturer in mathematics at the universities of Lagos and Ilorin, and looked poised to establish himself in a successful career in academics. •Married by the early 1970s, he and his wife were facing some problems in having children. They had two children through caesarean surgery and the doctors had advised them against having more. But the couple desperately wanted more children and thus embarked on a spiritual journey to seek a solution. •They came to the Redeemed Christian Church of God (RCCG) in 1973 which was then headed by the General Superintendent, Pastor Josiah Oluwafemi Akindayomi. He became a born-again Christian on 29 July, 1973, and decided to dedicate his life to the service of religion. •He became actively involved with the church and began propagating the gospel. In 1975 he was formally ordained a pastor. •Initially his duty at the church was to translate Akindayomi’s sermons from the pastor’s native language Yoruba into English. Eventually he started organizing Bible Study meetings, Crusades, Revivals, Outreaches and the evangelistic programs known as the Congress which proved to be very successful. •Impressed by the young man’s dedication towards religion Akindayomi decided that Adeboye was the man meant to succeed him. In 1981, Akindayomi died and Adeboye took over the leadership as the church’s General Overseer based on an instruction left by Akindayomi prior to his death. •As the leader of the church he worked hard to expand the organization’s outreach and today the church has branches in 110 countries all over the world from Haiti to Germany, from India to the UK, and also in the US. Pastor Adeboye is today considered to be one of the most influential pastors in Nigeria. 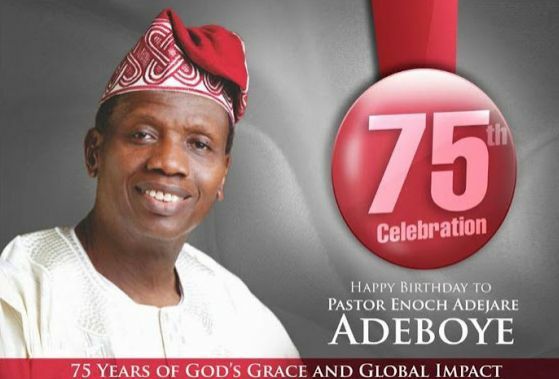 •As the General overseer of the Redeemed Christian Church of God (RCCG), he was instrumental in its vast expansion. The church, which was practically unknown when he took over, now has its branches in over a 100 countries all over the world including more than 14,000 in Nigeria. •He was awarded the Order of the Federal Republic of Nigeria by the Nigerian President in 2008. •In 2009 he was named one of ‘The World’s Fifty Most Powerful People’ by Newsweek Magazine (USA). •He is the recipient of several honorary degrees including an honorary doctorate degree from the University of Lagos and an honorary doctorate degree from the University of Nigeria, Nsukka. •He was presented with the Spiritual Pillar of Nigerian Sports, a National Sports Honor in 2010. •He married Foluke Adenike Adeboye at the age of 25 in 1968. He was a fresh graduate and thus the couple had a very simple marriage. The couple faced considerable financial challenges in their initial years together even though they were very much in love. His wife is also a pastor. •He has four children, all of whom also became pastors later on. He is also a proud grandfather to several grandchildren. Happy birthday to a respected man of God!